2016 Yamaha Kodiak 700 EPS SE, Built for work but boasting an eye‑catching look that begs to play. (187)-695-1600 - Special Edition Package The 2016 Kodiak 700 SE features an aggressive look with black alloy wheels, sharp Carbon Metallic painted bodywork and special graphics. High-Tech Engine, Built for the Real World The 2016 Kodiak 700 has an all-new 708cc, 4-valve, fuel-injected engine with optimized torque, power delivery and engine characterideal for smooth, quiet operation all day long. Ultramatic  The Industrys Most Durable CVT Transmission Kodiak 700s Ultramatic transmission features a gated shifter, dual-range (Hi/Lo) drive plus reverse gear and is the most advanced drive system available  plus, the gear ratio and Kodiak-specific CVT settings are designed to lower engine RPM and provide a smooth, easy-to-use power character. An automatic centrifugal clutch maintains constant belt tension for reduced belt wear and a sprag clutch provides natural all-wheel engine braking. Yamahas Exclusive On-Command 4WD The three-position On-Command 4WD system lets you switch between 2WD, limited-slip 4WD and a fully locked differential 4WD all with the simple push of a button. Override button allows engine to make maximum rpm in full diff. lock mode. 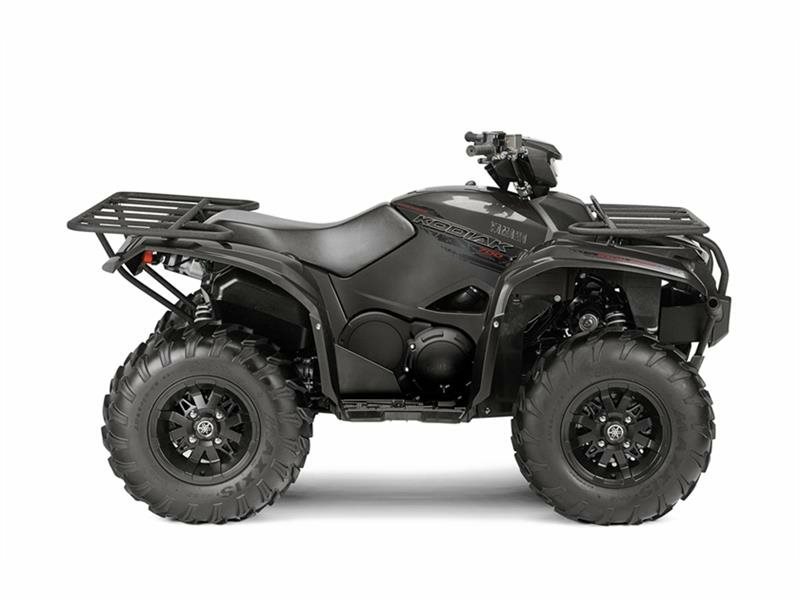 Compact, Comfortable Chassis The Kodiak 700 features a compact and comfortable new chassis with fully independent suspension, exclusively-designed 25-inch Maxxis tires and wide arc A-arms providing optimum terrainability, comfort and handling. Sharp Styling The Kodiak 700s styling features bright halogen headlights with a handlebar-mounted auxiliary light, large storage compartments and large-diameter front and rear racks with class-leading load capacity. Advanced Instrumentation New digital instrument panel boasts a multifunction LCD display with speedometer, odometer, dual tripmeter, hour meter, 4WD status, transmission position, clock and fuel gauge. Class-Leading Power Steering Yamahas Electric Power Steering provides the industrys best balance of steering assist and positive feedback from the trail, providing maximum comfort and confidence. Work-Ready Tow Capacity Center-mounted, heavy-duty two-inch receiver comes standard and can tow more than 1300 pounds. HARD WORKING GOOD LOOKS. Built for work but boasting an eye-catching look that begs to play. The all-new Kodiak 700 Special Edition. Built Real World Tough.